I just listened to this extremely interesting interview with Brian Leiter over at Philosophy Bites about "Nietzsche Myths." The "Nietzsche wasn't actually an anti-Semite whose philosophy was all about the notion of the Overman" part was pretty much stuff that I knew, although it was explained nicely, in a concise, entertaining and well-reasoned way. The interesting part to me was the last bit, about the way that folks like Derrida and Foucault tried to claim Nietzsche as a proto-post-modern skeptic about truth and meaning. Leiter argues that this doesn't make a hell of a lot of sense. 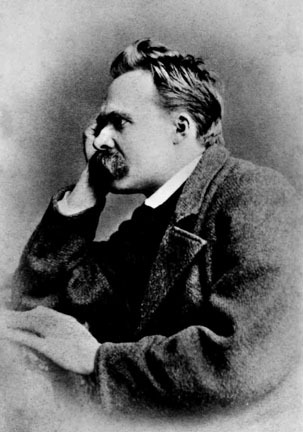 The one essay in which Nietzsche says post-modern-sounding things about truth was one that he never gave anyone permission to publish, whose themes he never returned to in his later work, and which flatly contradicts and makes nonsense of a great number of the views that he implicitly assumed or even explicitly endorsed in the work that he did think enough of to publish. ....if one of the main themes of post-modern skepticism about truth and meaning is that texts don't really have any kind of fixed meaning having to do with anything as banal as context or consistency or authorial intent, but that they can be legitimately interpreted in a more or less infinite number of incompatible ways...and the argument between advocates of this view who see Nietzsche as an early-co-thinker and boring "analytic" Nietzsche scholars like Leiter is about what the textually-best-supported reading of Nietzsche's views is...it shouldn't exactly be shocking that they come to different conclusions. In fact, it's amazing that the differences aren't a lot greater. PNE: In Thus Spoke Zarathustra, Nietzsche makes the bold assertion that President Obama is actually a lizard-like alien creature, a la the classic science fiction television series V.
NNS: What? How is that possible? Nietzche died in 1900, and Barack Obama wasn't even born until 1961. NNS: Yeah, OK. Whatever. But where are you even getting this? PNE: From the passage where Zarathustra talks about his admiration for tight-rope-walkers. NNS: Wait. The passage about tight-rope-walkers was a metaphor for Obama being an alien lizard creature? PNE: Why privilege that interpretation of what I just said? My statement "From the passage where Zarathustra talks about his admiration for tight-rope-walkers" could just as easily be read as a statement about about the war in Afghanistan, in which the signifiers "Zarathustra" and "tight-rope-walkers" were used to dialogue with Vice President Biden's support for a strategy of relying on Predator drone attacks rather than more troops on the ground. PNE: Are you honestly assuming some restrictive narrative of authorial intent whereby my reading of my statement at the time I said it is privileged over any other? You focus on Leiter's discussion of the unpublished essay, but I would think it is the perspectivism that appears in the published works (which Leiter also discusses) that most sets up Nietzsche as proto-postmodernist. I mean, I don't hear many discussions of that essay, but Nietzsche's perspectivism is one of the most famous aspects of his work, no? Why are you lumping Foucault in with Derrida? Leiter is a critic of original intent when it comes to the US Constitution, but the Living Tree theory of Nietzsche is post-modern irrationalism. "On Truth And Lies In The Non-Moral Sense" is an essay that's been cited in every discussion of Nietzsche-as-a-proto-postmodernist that I've ever seen, but maybe I've been hanging out with the wrong people. I actually think that the designation "analytic" at this point has almost no content. Most so-called "analytic philosophers," if and when they use "analytic," use it as an honorific for what they regard as good, rigorous philosophy, and some contemporary "continental" types use is as an equally empty term of abuse for people who present clear arguments instead of free-association babbling about "theory." But given the range of subjects that "analytic philosophers" work on, and their range of views about those subjects, including super-basic methodological issues (think about Gil Harman's critique of logic), I don't think "analytic philosophy" is useful even as a family resemblance term. If it refers to anything, it's a histoircal/sociological category, not a philosophical one. ...which all goes to say that I don't care whether Nietzsche, or Foucault, or anyone else, is "analytic," since I don't regard that as a particularly meaningful question (at least in any interesting sense). As far as lumping Foucault in with Derrida, to be honest, I haven't read any Foucault since I had to for an undergrad "contemporary philosophy" class (where "contemporary" meant "late 20th century continental"), and so I might have a residual bad taste in my mouth from that class that could, I guess, be unreasonably clouding my judgment. Maybe I should re-read him. What would you recommend? Despite both of our first names starting with the letter "B," I am not in fact Brian Leiter. I don't know why you assume I agree with him about all subjects whatsoever because I said something nice about what he said in one context. When I say, "hey, you should listen to this podcast, it's fun and what Leiter says about Nietzsche makes a lot of sense," it doesn't make a hell of a lot of sense to object to *that* assertion of mine on the grounds that Leiter (not me) may have a view on some totally unrelated subject that's in tension with his view about Nietzsche. If you want to criticize *him* for being inconsistent, the man has a Nietzsche blog, and a legal philosophy blog, and he allows comments on both. Go there. That said, because you did bring it up here, I'll say I'm having a lot of trouble seeing what you think he inconsistency is. Original intent is pretty relevant to questions of how to interpret the views of individuals, and pretty irrelevant to how to interpret some general moral or legal principle invoked by the writer of a legal document. If Nietzsche had denounced cruel and unusual punishments, and someone interpreted Nietzsche as opposing the death penalty, historical evidence about whether Nietzsche regarded the death penalty as cruel and unusual would be relevant to *that* (exegetical) question. It would, of course, have absolutely no relevance to the question whether the death penalty actually was a cruel and unusual punishment. Similarly, if one is a historian investigating the question of whether the framers of the Constitution and the Bill of Rights opposed the death penalty, the fact that they outlawed cruel and unusual punishment, and that the death penalty is cruel, is insufficient to establish that historical point without evidence that the framers thought so too, but if one is interested in the legal argument about whether the constitutional prohibition of cruel and unusual punishment makes the death penalty unconstitutional, the historical point is just sublimely irrelevant. Wow. Your criticism of the US Constitution/Nietzsche comparison makes sense but the paragraph preceding it is one of the weirdest I've seen on a philosophy blog. You were very cordial in your reply to me, so this is totally disinterested - what did you find so strange or jarring about an on-topic criticism of Leiter being posted in reply to your original post about Leiter??? I'll ignore the first part of your response since it's answered in the second. I posted the comment because I assumed you'd make the same mistake as Leiter, and you have. Though I'm not sure 'mistake' is the best word to use. A text is a text, whether it's Nietzsche or the Constitution. By your logic, when statements written 200 years ago are used to direct policy today, then meanings are up for debate, but when they concern grand abstractions the author's voice is clear. In philosophy the rubber never needs to meet the road. You should read Jack Balkin, or Richard Taruskin, maybe even Monroe Beardsley. You might learn something. If learning something's what you want to do. And Leiter linked to this post. Pretty clearly, we disagree about whether it was on-topic. It seemed like a postshot against Leiter by someone with a fairly specific axe to grind, and one that didn't have much of anything to do with the subject of the post. "...when statements written 200 years ago are used to direct policy today, then meanings are up for debate, but when they concern grand abstractions the author's voice is clear." ...is so far from anything I even came close to suggesting that it seems safe to bet that further discussion about this isn't going to be fruitful. "Original intent is pretty relevant to questions of how to interpret the views of individuals, and pretty irrelevant to how to interpret some general moral or legal principle invoked by the writer of a legal document." You're using different standards for legal as opposed to philosophical documents Are some texts determinate and some not? If so that seems as I said to depend on the relation of rubber and road. Or are you saying we can understand Nietzsche's intent as an author but not it's relation to what he wrote? A psychic link across space and time? And it's not about Leiter, it's about what you have in common. "...if one is a historian investigating the question of whether the framers of the Constitution and the Bill of Rights opposed the death penalty, the fact that they outlawed cruel and unusual punishment, and that the death penalty is cruel, is insufficient to establish that historical point without evidence that the framers thought so too, but if one is interested in the legal argument about whether the constitutional prohibition of cruel and unusual punishment makes the death penalty unconstitutional, the historical point is just sublimely irrelevant." "You're using different standards for legal as opposed to philosophical documents"
He's pretty obviously not doing anything remotely like that at all. You are so sober in your (accurate) denial of the value of a species "analytic," yet so lax and uncritical in your assumption of a species "postmodern." You aren't wrong to note that Derrida babbles. Well, babbled. And Ayer was pedantic and, many would say, myopic and stultifying. Yet you seem convinced that the former has cooked up some identifiable movement that threatens upright-and-scholarly philosophers everywhere, while the latter is just an interesting blip on the radar screen. I think it's mostly just a series of blips: there's a Timothy Williamson for every Judith Butler, a Ted Honderich for every Luciano Floridi. But none of them should be held up as torch-bearers for any sweeping socio-philosophical movement. Also, I appreciate the sarcasm of the original post. But for what it's worth, I've spent lots of time in the darkest, sexiest corners of contemporary Continental philosophy, and I've not heard anyone espouse that (a) the present can pre-date the past, or (b) all interpretations of a text are equally valid.